But Chihuly’s newest body of work marks a sharp turn inwards. In the painted glass panels that make up his Glass on Glass works, another sort of radiance is at work—vivid coloration is watered down by transparency as Chihuly explores the permeability of glass to light. The resulting large-format panels depict his signature expressionist forms rendered in glass enamels which, layered on sheets of clear glass, are diluted by the light flooding through them. The effect is transformational. Glass contributing editor Victoria Josslin visited with Chihuly to discuss the significance of the Glass on Glass series, and meditates on the shift in mood and tone in this 78-year-old artist’s late-period work. Chihuly cites the stained glass in European cathedrals as inspiration for his latest body of work. The glassblowing duo of Philip Baldwin and Monica Guggisberg took this one step further when they took over Canterbury Cathedral, a site of historic religious pilgrimage, for their site-specific installations considering contemporary refugees and migration. Titled “Under an Equal Sky,” their large-scale assemblages of blown glass owe a considerable debt to the vision and innovations of Chihuly, but also employ the ability of glass to capture and amplify ambient light. Jeffrey Sarmiento dissects the project and its effects in an insightful article. Cobi Cockburn takes glass in a different direction with her white-hued landscape paintings in kiln-formed glass that capture light in their intricately worked surfaces. Glass contributing editor William V. Ganis examines her past and current work and discovers a three-dimensionality that lures viewers into considerations of perception and existence. To celebrate this new Spring season, our last feature, by contributor Alexander Castro, presents a thoughtful take on Harvard’s “Glass Flowers,” the way many refer to one of the most extensive collections of the virtuosic achievements of lampworkers Leopold and Rudolf Blaschka. Castro considers the aesthetic implications of their uncanny mimicry of botanical forms, which, since a 2016 renovation, are presented with greater focus and improved lighting and display conditions. As the season brings warmer weather and longer days, this issue celebrates all the ways glass brings us light. The Corning Museum announces artists selected in landmark “New Glass Now” exhibition opening in 2019; three artists celebrate longstanding friendship in Traver group exhibition; astronomers trace source of basic ingredient in glass to ancient supernovas that dusted universe with silica; in Norfolk, Virginia, the Barry Art Museum, displays glass and other collections; after departing the Chrysler Museum to raise a family in her native Vermont, Charlotte Potter takes on executive director post at Yestermorrow. 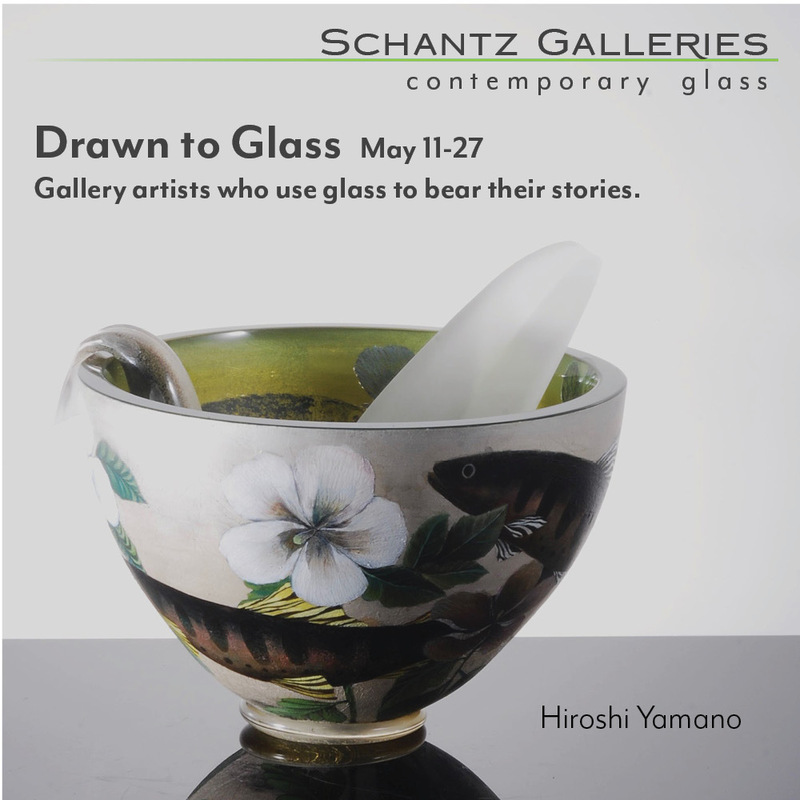 Laura Donefer at the IUPUI Cultural Arts Gallery, Indianapolis, Indiana; Etsuko Ichikawa at Winston Wächter Fine Art in New York City; group exhibition on “An Alternate History of Glass” at Heller Gallery in New York City. 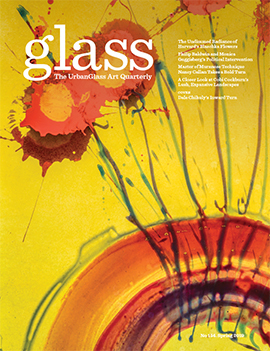 Recognizing the incredible individual donors and institutional supporters who keep our studios state-of-the-art; our programs cutting-edge; and our magazine, Glass: The UrbanGlass Art Quarterly, an important part of the conversation in contemporary art. Back to Batch? Artist and educational studios struggle to wean themselves off cullet after Spectrum stops making nuggets. Dale Chihuly, known for his flamboyance in color and form, makes a surprising turn inwards. Aggregating sculpted blown-glass forms into vessels, Philip Baldwin and Monica Guggisberg reference and update Canterbury Cathedral’s historical role as a destination for pilgrimages, connecting the centuries-old shrine to the current refugee crisis. Though Cobi Cockburn’s minimalist panels resemble paintings, close examination reveals a three-dimensionality that invites meditation on perception and existence. Hired by Harvard University to make botanical models for study, the father-and-son team of Leopold and Rudolf Blaschka created exquisite works of astonishing verisimilitude that still enthrall visitors from around the world over 100 years later. Having mastered Muranese glassblowing, Nancy Callan expands the traditional through innovative forms that take glass in directions both pungent and pure.